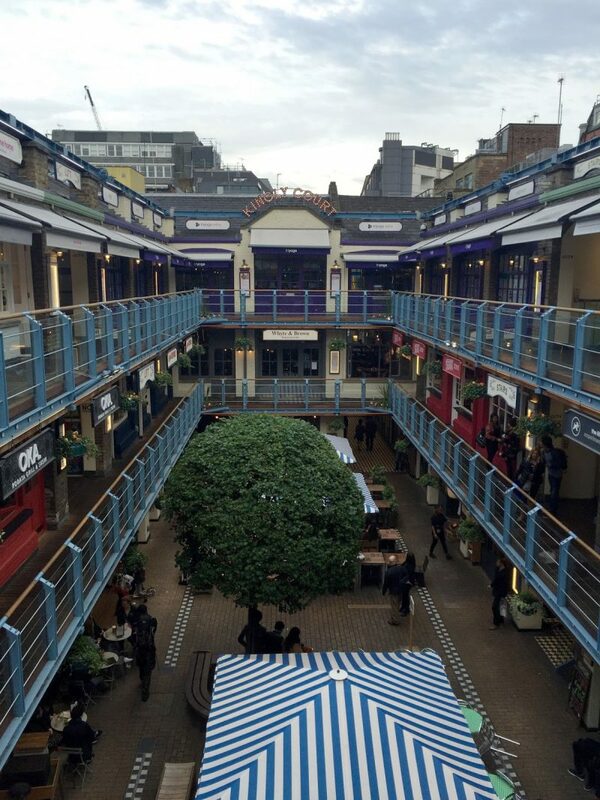 I’ve not come across Kingly Court until quite recently. 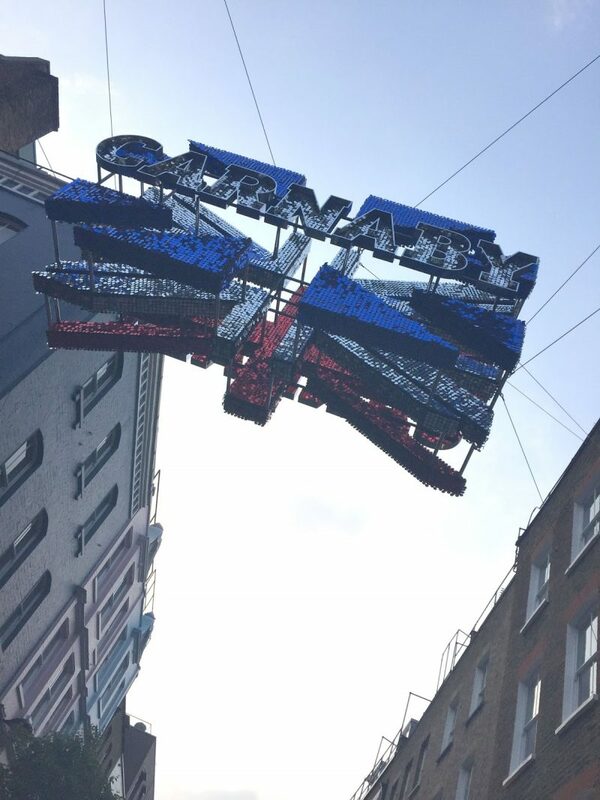 Considering I’ve been to Carnaby Street a few times, I was surprised to realise I’d completely missed out on Kingly Court during those visits. Back in May, Lee and I headed there for our anniversary to a spot that had been recommended to him by friends & colleagues. 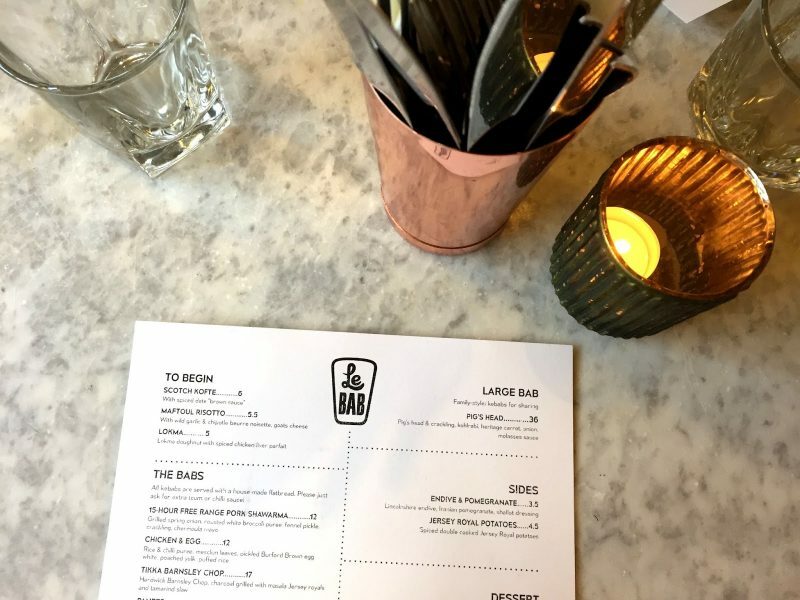 Le Bab – I have to admit I was doubtful, just a fancy kebab place? And ok – that’s what it is (and they do say that online), but hey it was great. Bright & white decor and a very simple menu. 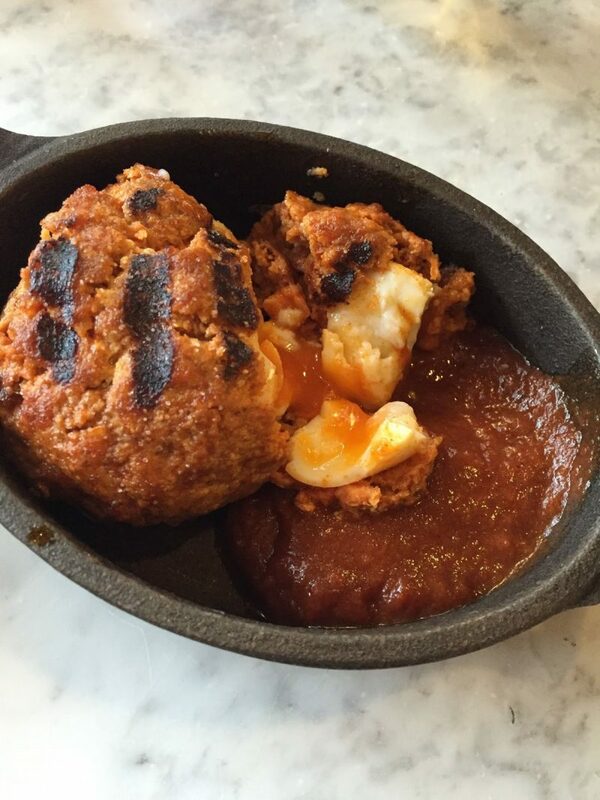 To start we had Scotch Koftes, literally like a scotch egg but with bbq meat and a delicious brown sauce to complement it. Lee (having always “claimed” he hates scotch eggs) ordered this too, and thoroughly enjoyed it, which I was really pleased about because I love people finding new foods that they love! 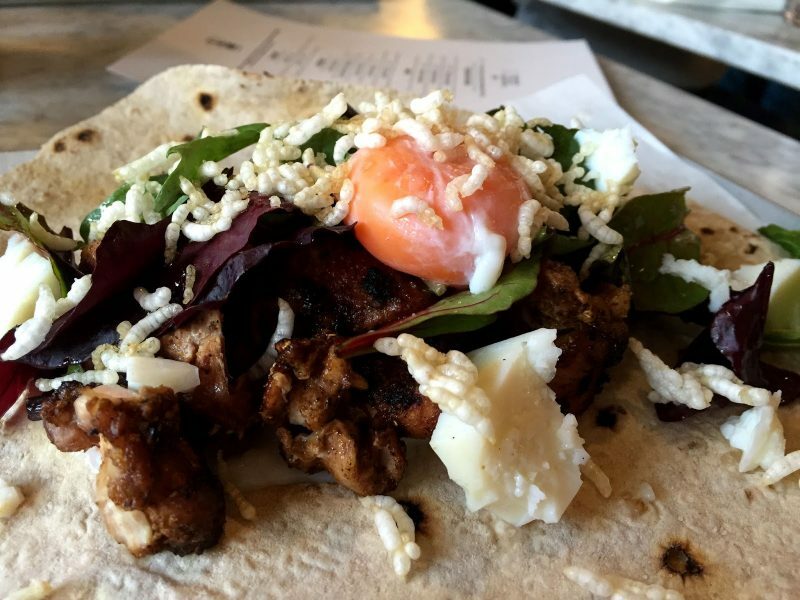 For mains I had Chicken & Egg kebab, which arrived with rice & chilli puree, a picked egg and yolk and puffed rice. 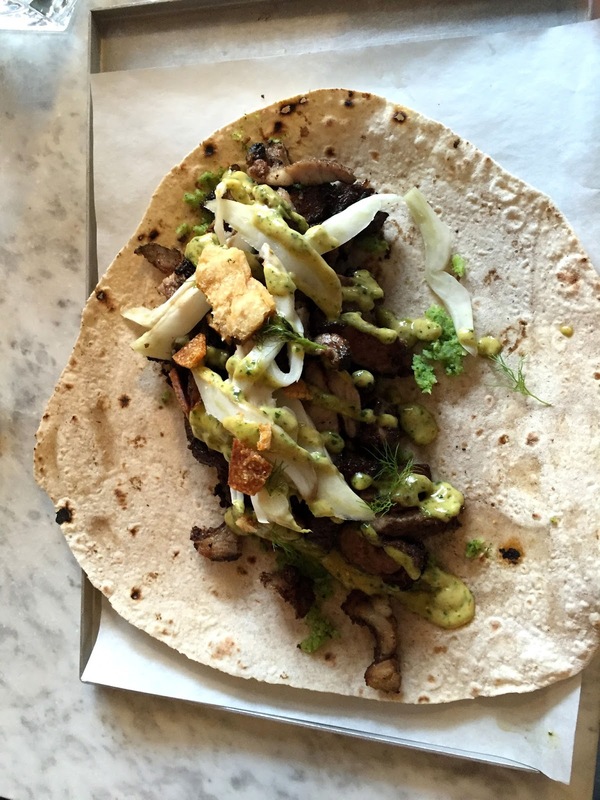 Lee’s 15-hour free range pork shawarma arrive with spring onions, white broccoli puree and some chermoula mayo (whatever that is)! 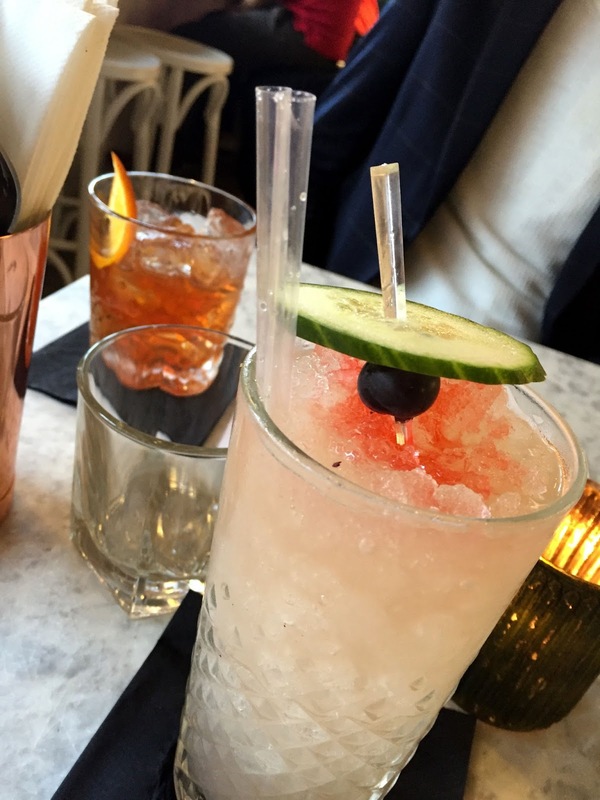 To complement our fancy kebabs we indulged in some tasty cocktails. 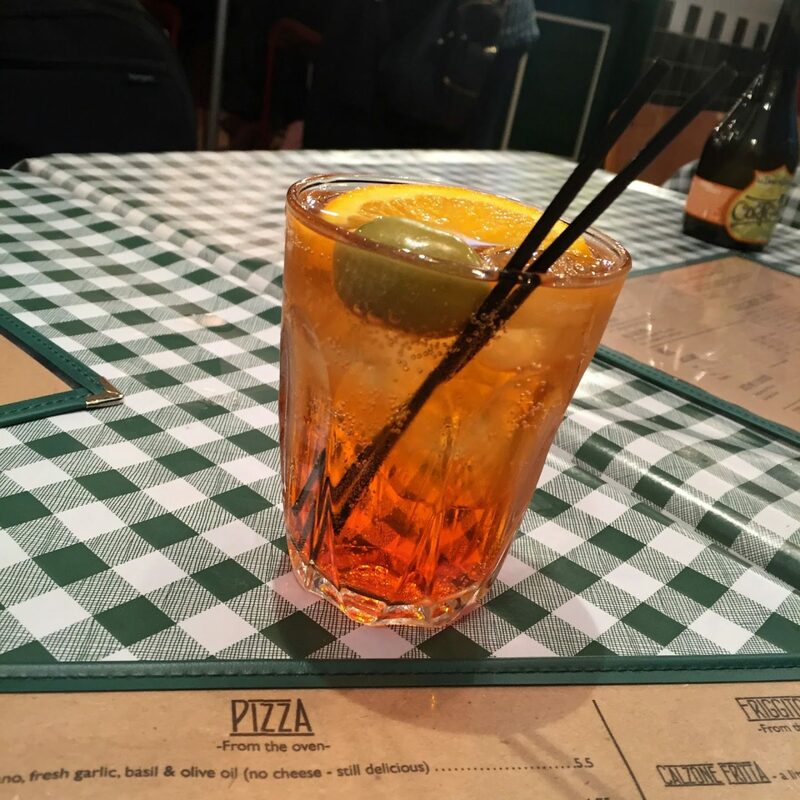 Food was reasonably priced for Central London but the drinks were pretty pricey – having a soft drink would definitely lighten the bill up, very delicious though! Just a few days later my Dad was in town, so with the task of taking the boys out for dinner and chose Pizza Pilgrims having seen it at Kingly Court the week before. Lee and I had attempted to visit the one in Soho two or so years ago when we were first dating so I was keen to get a slice of the action (see what I did there). The garlic bread was cheesy and nice and the pizzas came very quickly. Lee’s was really spicy, mine had ham and cheese on – really good. 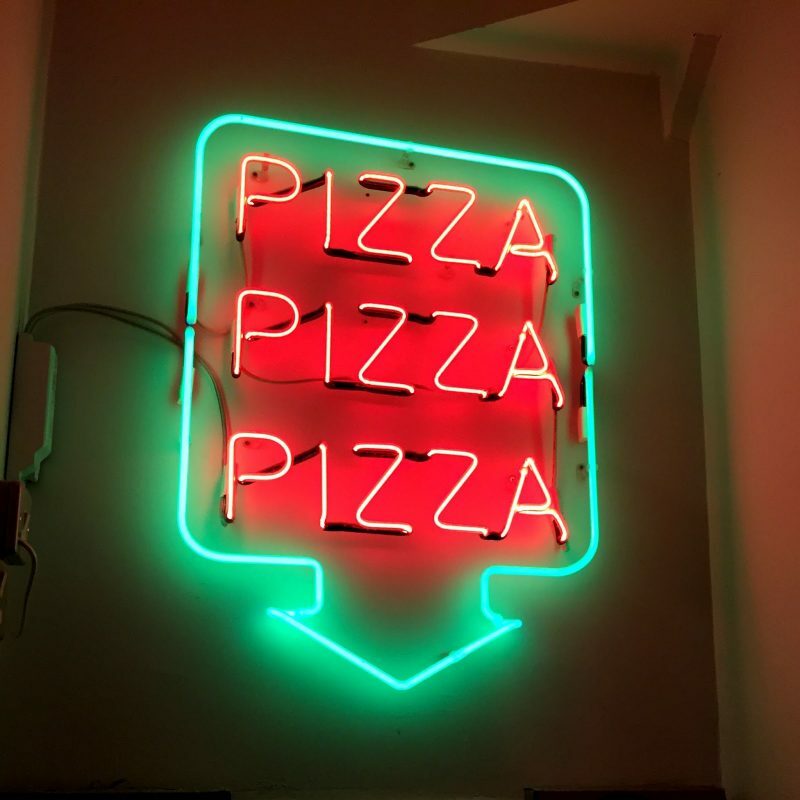 Despite heading there pretty early in the evening pretty quickly got busy with groups of friends heading in for a pizza. Love the checked table cloths and the (again) simple menu. 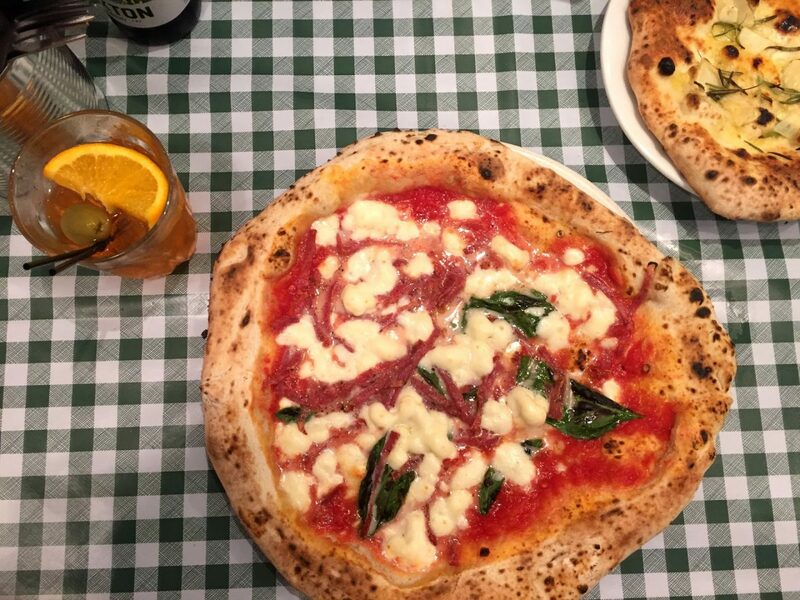 Not too pricey for a pizza, definitely worth tasting – my next pizza stop has to be Franco Manca, I’ve walked past the one in Balham so many times recently and I need to try out their sourdough bases, they’re meant to be great too! Watch this space. 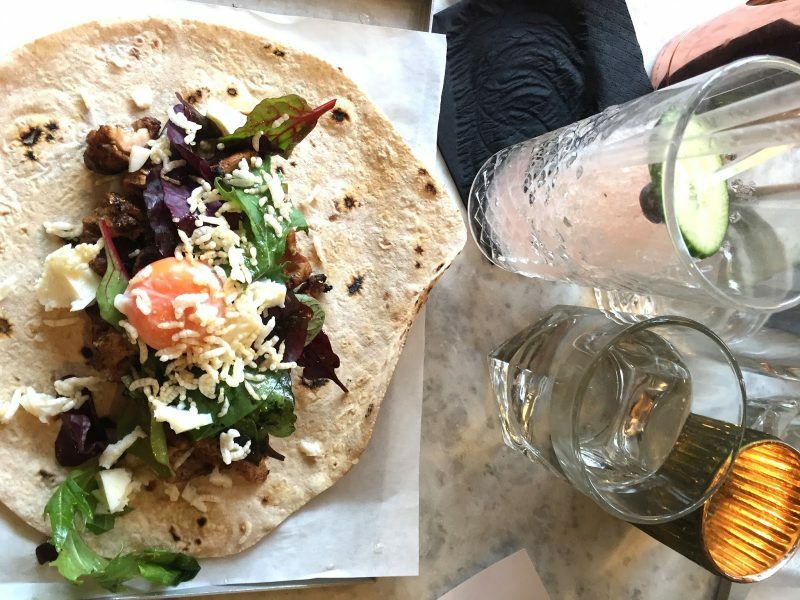 Have you eaten at the restaurants in Kingly Court? Any others you’d recommend? Next Post A Sunday Summary – what’s next for Warsaw’s World?